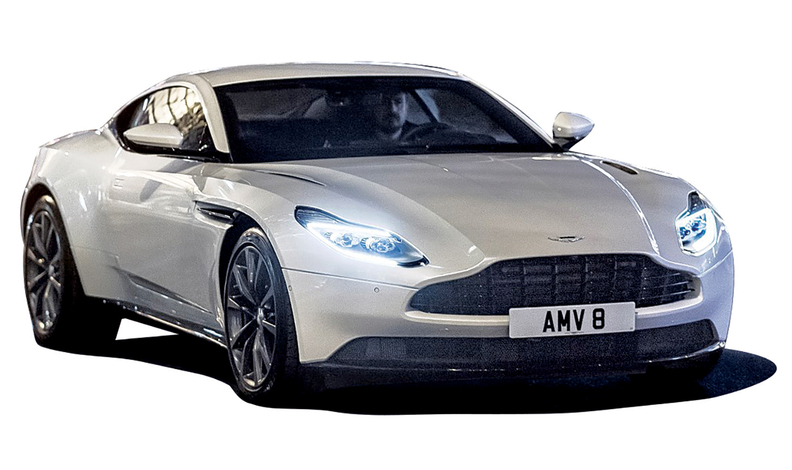 Aston's DB11 V-8 boasts a 0 to 100 kph (62 mph) time of four seconds flat. Aston Martin has launched the DB11 V-8, the first Aston to use the 4.0-liter turbocharged engine developed by Daimler's AMG performance arm. The new "entry-level" variant of the supercar debuted June 30 at the Goodwood Festival of Speed, Britain's de facto auto show, this month where it was driven in front of the crowds by Aston CEO Andy Palmer. The DB11 already borrows Daimler's electrical architecture, a technology swap that's arguably more important than the engine to a small company such as Aston because of the sizable development cost of elements such as the infotainment system. But Palmer has said that taking the V-8 enables Aston to concentrate on its 5.2-liter V-12 engine, which Aston builds in a Ford-owned factory in Cologne, Germany. Despite losing four cylinders to the 600-hp V-12, also turbocharged, the 503-hp 4.0-liter V-8 doesn't give much away to its bigger brother on performance. The quoted acceleration time to 100 kph (62 mph) is four seconds flat, 0.1 second slower than the DB11 V-12. The V-8 version costs 184,000 euros in Germany while the V-12 starts at 208,900 euros. The AMG V-8 engine will be used across Aston's sports car range, including the Vantage entry model due to be replaced next year. Daimler has a 5 percent stake in Aston Martin.